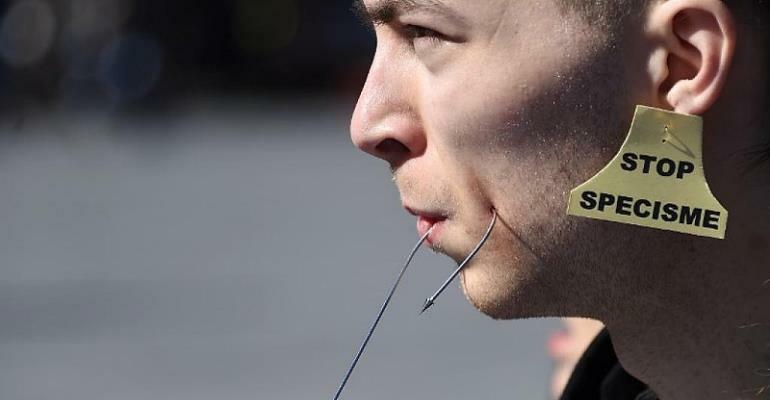 Activists from the group 269 Life France gathered in Strasbourg on Saturday with their cheeks pierced with fish hooks to protest against mass fishing practices which they describe as a "massacre". Four activists sat in Kleber place, in the city centre, holding fake fish in their hands, their cheeks pierced with a large hook. Standing around them in a puddle of fake blood, a dozen of the other 269 Life France members held placards which read "fish are sensitive, you are allowing them to be massacred", and "fishing: a real killing spree". "A large number of these animals go through agony in the open air, are bled to death and eviscerated while still conscious or are thrown back at sea using pitchforks," reads the website page for The World Day for the End of Fishing, marked on 30 March across the world. A spokesperson for the group, Chloé Ka, says the piercing was done by a professional for the occasion, part of an action calling for "the abolition of fishing and fish farming for fish, crustaceans and cephalopods". According to the UN organisation for Food and Agriculture (FAO), 100,000 fish are killed each second and individual consumption of fish has now gone up to 20 kilogrammes per year. Handing out leaflets to the public, the members of the collective point out that fish are "harpooned, skinned and scaled alive, and because their screams are silent, they remain the forgotten species in the animal world." 269 Life France has organised similar protests in Paris, Montpellier, Saintes (Charente-Maritime), Angers, Amiens and Marseille, indicated Chloé Ka. Another French animal right group L214 has also planned events to inform the public of world anti-fishing day.